I love having flowers in the house and just lately I have had some beautiful bouquets given to me. 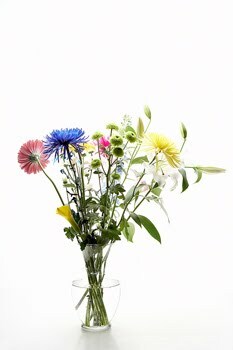 Unfortunately, cut flowers don't last long unless you show them a little TLC. To make them last, cut off the ends of the stems, and add a dash of salt to the water to keep your flowers fresher longer. When your flowers start to droop, give them a second life by cutting the stems off near the blossoms and floating them in a bowl of warm water into which you have mixed a crushed aspirin tablet. It must be aspirin, not paracetamol.